While setting up and upgrading Dynamics GP for clients, I often find disaster recovery planning is something that is overlooked. Often, only the databases are backed up and newly created companies have not been added to the backup plan. In light of this, I want to walk you through what you’ll need to have ready to bring up your GP system quickly in the event of a disaster or data loss. For the purposes of this blog, we will assume that only the SQL Server needs to be recovered. In this case, no software will need to be reinstalled unless it was installed on the SQL server itself. Since all our other servers are still up and running, but are pointed to the SQL server, the software on these servers would be safe in this case. It is important to capture SQL logins from the SQL server running GP so that you can recreate them on the new server. Follow the instructions found here and copy the results to a text file. This file will be used as you build your new server. 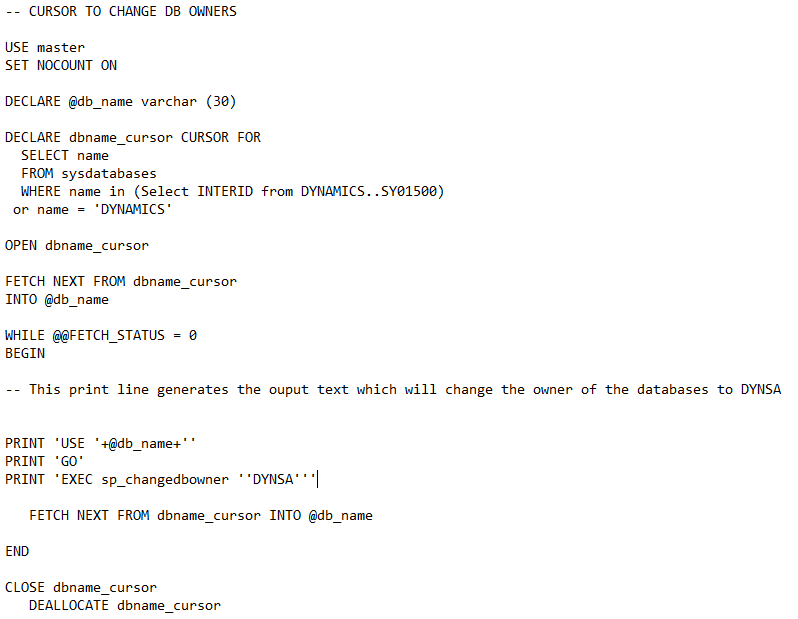 Running the SQL script below will show you all of your Dynamics GP companies including test companies. These are the companies that you will need to backup. If you have Management Reporter, you will need to also backup that database and any 3rd party software databases. Please note, the Management Reporter and 3rd party software databases will not be included in the select statement included in this bracket. Generally, there is a GPShare folder that contains dictionaries and forms required for GP. You must backup all of these folders, as any missing dictionaries will cause issues during the restore. For this step, I recommend using volume shadow copy. Sometimes, when multiple users are making changes to reports, the reports.dic can become corrupted. Depending on how often reports are updated or changed, a daily backup may work for this, but would likely increase the time to recover and restore data. If you don’t remember what was installed in GP, or don’t remember where the GPShare is mapped to/located, you can find all this information in the Dynamics .set file. The Dynamics .set file is located in the default GP installation directory. Backup all of the installation media that was used to create your current environment. This will ensure that during the reinstall of GP everything is at the same version. During the creation of the new server, be sure to keep it simple by installing the same version of SQL on the same Operating System. If you can, give the SQL server the same name as the server that failed. This allows you to create an SQL alias so that you do not have to run repairs on all the software to point to the new SQL server and instance. Once SQL is installed, you can install Dynamics GP with all the required updates and hotfixes as the original installation. Note: If Dynamics GP was installed on another server that did not require recovery ignore this step. Next, you’ll need to run the SQL script that will create the SQL logins that you captured in step 1. After running the script, you will have to reset all the SQL login passwords. To do this follow the steps in this blog. Once that is complete restore all of the databases including all of the 3rd party applications. Next, run the Dynamics GP SQL Grant script on each GP company. You can then run GP Utilities. If you have followed the above step you should not receive any errors and should be able to login to GP. If all of your 3rd party applications were installed on your SQL server or your entire GP environment (all GP Servers), then your SQL server or GP environment won’t work until you install these 3rd party applications. If this is the case, simply complete the installations and remember to select the option using an existing database instead of creating a new one if prompted. This way, you will be able to recover your existing 3rd party application configurations and your GP environment will be back up and running. If you need help preparing for disaster, FMT is there for you. With our help, worries about server breakdowns, network failures, and other IT-related setbacks become a distant memory. If you’d like to learn more about how FMT can help you prepare for the worst, simply contact us using the form below. We’d be happy to help! Stanley is a Senior Consultant in the IT practice at FMT.